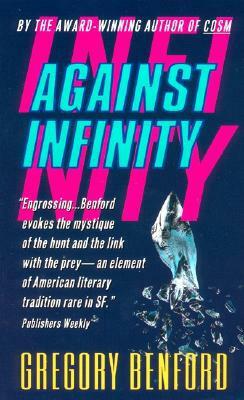 A gripping, masterfully written adventure set against the violent beauty of a planet in the throes of cataclymic transformation, Against Infinity is Gregory Benford's timeless portrait of a young man's comming of age. On the poisonous, icy surface of Ganymede, a man and a boy are on a deadly hunt.Their prey is the Aleph --an unknowable alien artifact that roamed and ruled Ganymede for countless millennia. Indescribable, infinitely dangerous, the Aleph haunts men's dreams and destroys all efforts to terraform Ganymede into a habitable planet. Now in a modern world ancient struggle is joined, as a boy seeks manhood, a man seeks enlightenment, and a society seeks the power to rule the universe. On the poisonous, icy surface of Ganymede, a man and a boy are on a hunt for the Aleph--an alien artifact that ruled Ganymede for countless millenia, Infinitely dangerous, the Aleph haunts men's dreams and destroys all efforts to terraform Ganymede into an habitable planet. Now an ancient struggle is joined, as a boy seeks manhood, a man seeks enlightenment, and a society seeks the power to rule the universe.